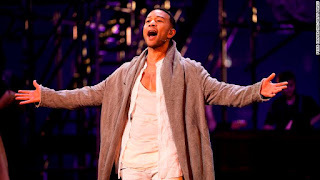 In just a few hours John Legend will take the stage as Jesus Christ in NBC's live musical "Jesus Christ Superstar Live in Concert." It's the latest live musical from NBC, which previously has aired "Sound of Music Live," "Peter Pan Live," "The Wiz Live" and "Hairspray Live." Below is everything you need to know about the musical that airs live on Easter Sunday. Photos: When Jesus came to Hollywood John Legend stars as Jesus in NBC's Easter 2018 live production of the musical "Jesus Christ Superstar." Jesus has been portrayed by a variety of actors throughout the years. The real life event takes place on Easter Sunday, April 1, 2018, at the Marcy Armory in Brooklyn, New York. It airs live starting at 8 p.m. on NBC and will also be available on Hulu. Alongside Legend is Sara Bareilles, who will play Mary Magdalene. The actress and singer has appeared in the Broadway show "Waitress" and is known for the hit 2008 song, "Love Song." Brandon Victor Dixon is set to play Judas Iscariot. Some viewers may recognize him from Lin-Manuel Miranda's "Hamilton," portraying Aaron Burr. Dixon made headlines for addressing Vice President Mike Pence when he attended the show in 2016. Rocker Alice Cooper will play the part of King Herod. It's a return of sorts for Cooper, he voiced Herod in the 1996 recording of the musical. "Jesus Christ Superstar" debuted on the stage in 1971. The story chronicles the last week of Jesus' life. Creators Andrew Lloyd Webber and Tim Rice are returning to executive produce the live event. The stage production and subsequent 1973 film starring Ted Neeley were denounced by some religious organizations. Jewish groups called it anti-Semitic, and Catholic and Protestant organizations felt it was blasphemous. The stage production, meanwhile, earned five Tony Awards. It has also become somewhat of a standard among theater groups across the world, having been performed in 20 countries and translated into 18 languages. Grammy award winning producer Harvey Mason Jr., who is the music producer of "Jesus Christ Superstar Live in Concert," told CNN that this is not just a musical for people who celebrate Easter. "It's great entertainment. [Easter] is a day when families are together. A day when people are looking to share common experiences and have bonding moments. This is really a family piece of entertainment and art ... the message is perfect for not only Easter but what is going on in our world right now and in our country. It's a positive message and I think it's something everyone will appreciate. Not just Christians or Jewish people or religious people or any one particular race. It has a universal message and it has universal entertainment appeal." 0 Response to "Jesus Christ Superstar: Where to watch and what to expect"